Awarding organisations could be forced to withdraw qualifications with units shared with other bodies after Ofqual announced plans to close its “unit bank”. Under the proposals set out in a letter from the regulator, awarding organisations have until July 31 to withdraw units shared and developed with others or allow those competitors to “treat them as their own”. If units are withdrawn, awarding organisations will have two years to replace them in their qualifications and get them approved or withdraw the qualifications completely. 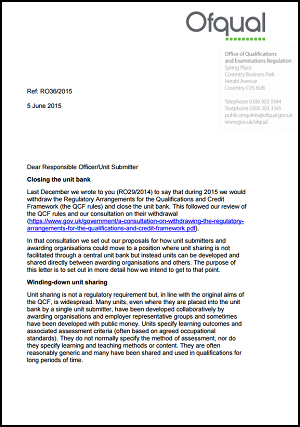 The closure of the unit bank is happening as part of moves to scrap the qualifications and credit framework, but it means units on the system will have to be withdrawn by the awarding organisations which developed them unless they want competitors “treating them as their own”. In the letter, Ofqual’s director of strategic relationships for vocational qualifications Naomi Nicholson, said the regulator would assume that awarding organisations which did not get in touch by July 31 did not intend to withdraw any units currently being used by other bodies and that they “do not object to the awarding organisations currently using those units treating them as their own”. Ms Nicholson added that Ofqual would also assume that awarding organisations which did not get in touch recognised that other bodies would “rely on these assumptions”. Organisations which don’t agree with “some or all” of the assumptions have until 5pm on July 31 to provide Ofqual with reference numbers for units planned for withdrawal from shared use and notify all other bodies using the shared units.